That was Brianna Desirae Beverly’s reaction to the recent Energy Awareness Fair, hosted by the Birmingham Chapter of the American Association of Blacks in Energy (AABE). The seventh-grader at Wilkerson Middle School already has big plans for her future, and through this fair, she saw firsthand that technology can help her reach those goals. More than 200 seventh-grade students and teachers from Wilkerson, Wylam and Hudson middle schools thronged the exhibits at the career fair at Alabama Power’s 12th Street Crew Headquarters in downtown Birmingham on Oct. 5. The event was designed to introduce students to careers in technology, engineering, math and science, particularly jobs in the energy sector. For those students interested in other career paths, there were booths that focused on business, human resources, marketing and accounting. The event was part of AABE’s annual Black Energy Awareness Month held in October. AABE sparks middle schoolers’ interest in energy, tech careers from Alabama NewsCenter on Vimeo. Phillip Coffey, chairman of the chapter’s Education and Scholarship Committee and Alabama Power market specialist, said the organization is hoping to “generate a spark” in these seventh-graders. Circe Starks said the chapter “intentionally” invited students from the Birmingham City School System. “We partnered with the Birmingham Education Foundation because we wanted to remove all barriers to attendance, such as lack of transportation, to maximize the opportunity for students to be exposed to future careers,” said Starks, Southern Power compliance director. Starks said the organization is striving to open these students’ minds to a whole new world. The fair featured outdoor demonstrations of drone technology, bucket trucks and electric cars. After they viewed the outdoor exhibits, the students moved inside, where they took part in hands-on activities. They toured a substation thanks to virtual reality, built a circuit, used iPads to view the innovations in the company’s Smart Neighborhood, and saw a robot in action and a mock-up of the new units at Vogtle Nuclear Plant in Georgia. The students played a bean game to learn about budgeting, participated in mock job interviews and wrote their own brief biography. 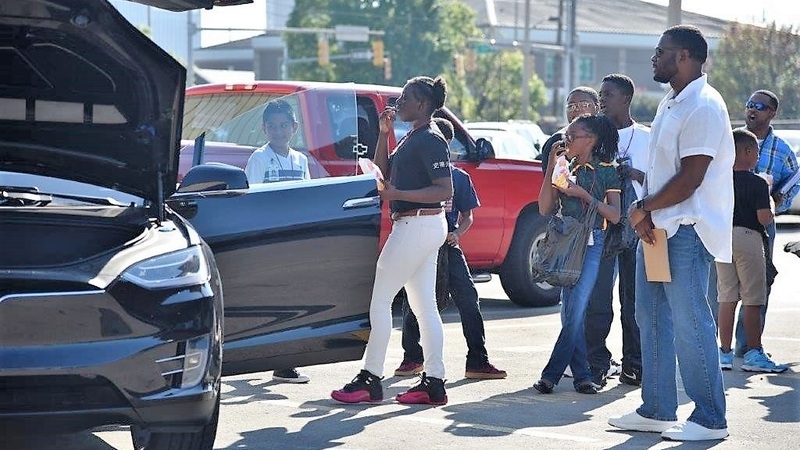 T’Marcus Threatt, Wilkerson Middle School seventh-grader, said the best part of the day for him was the bucket truck and drone demonstrations and learning the benefits of driving a Tesla. “I wanted to attend this event so I can learn about technology and the things around me,” Threatt said. The AABE Birmingham Chapter teamed with Alabama Power and the Birmingham Education Foundation to coordinate the event. 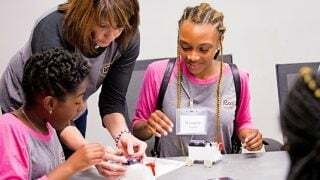 Other sponsors included the Alabama Power Service Organization, Southern Power, the Southern Company Energy Innovation Center, UAB, the National Society of Black Engineers (NSBE), McWane Science Center, iCan, Balch & Bingham and Bud’s Best Cookies. The AABE Birmingham Chapter works to provide energy professionals, executives, entrepreneurs and students a pathway to learn more about the energy industry through education, mentoring, community service and networking. As part of that effort, AABE provides scholarships to students to encourage them to pursue careers in energy-related fields.